Most of tonight’s episode is set inside the dimly lit FBI Counterterrorism black ops warehouse, where Harry Lennix likes to kid himself that he has a say in his own department’s operations, until Red shows up and sets him straight. Eager to get things rolling this time, Lennix has Red picked up in Munich and dragged back to the office, to be put in protective custody. Immediately, the power goes off, communications go down, and the building is invaded by Ritchie Coster, fondly remembered as the sad sack Renzo on the ill-fated HBO series Luck. Coster is Anslo Garrick, who knows about Red’s deal with the Feds, and has his own personal reasons for wanting to kill Red, after first abducting and “tortur[ing] the hell” out of him. The long twisted scar running down one side of his face, and the semi-paralyzed set of his mouth and jaw, are souvenirs from that time his old buddy Red shot him in the noggin. This is the closest thing to a pure action episode that The Blacklist has attempted. Joe Carnahan, thank God, is directing again. With him in charge, much of the action is comprehensible, and a few stray moments of it are striking. There’s even a top-notch piece of violent slapstick—a physical gag that’s not just well-executed and funny, but that actually sums up the dynamic between the characters involved—when Red, snug behind him glass walls, taunts Anslo; Ansolo reflexively raises his gun and fires it at the glass, and doesn’t even acknowledge it when the henchman standing behind him keels over from the ricochet. But on those rare, special evenings when this show is, more or less, competently made, that can only make you that much more aware of all the things about it that will always be irritating. The Feds are only able to bring Red in by tricking him into believing that there’s something up with his beloved Elizabeth Keen. When he’s informed that they want him close at hand because some “intel” they’ve picked up has made them worry about his safety, he’s dismissive: “With all due respect, if this intel was of any value, I’d have it.” Not only is he dismissive; he instantly knows what’s really going on, and patiently explains to his would-be protectors that they’ve been set up—the wily Anslo has fed them false information to spook them into bringing Red into their home base, where Anslo will be able to find him. The words are scarcely out of Red’s mouth before Ansol storms the compound, with his gang of mercenaries, “who call themselves the Wild Bunch.” (Blasphemy!) Would it kill Red to ever be wrong about anything, or at least a little bit slow on the uptake? Would it totally upend the whole show for Harry Lennix to ever be right about anything? Sherlock Holmes didn’t have this consistent a batting average. While Red is trading taunts with Anslo and doing his “MacGyver meets Florence Nightingale” thing with Ressler, Elizabeth is tiptoeing around the building in her bare feet, with one arm bandaged, whispering “Remember your training!” to herself while taking out bad guys, like Steven Seagal in Under Siege. 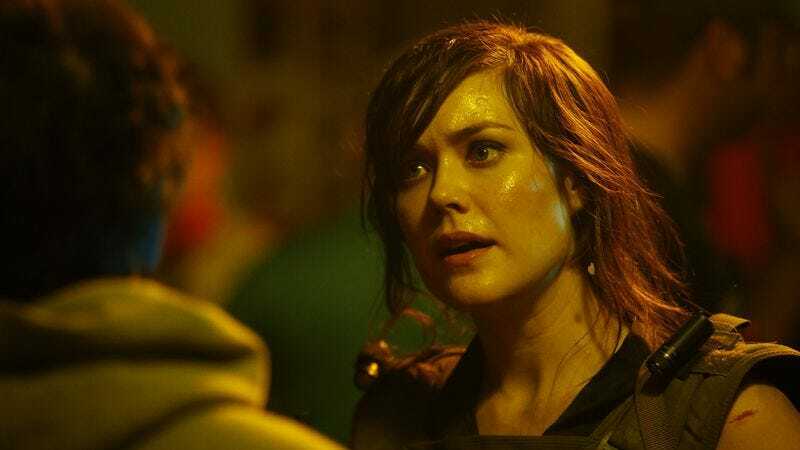 Maybe I should work on being a little quicker on the uptake myself, but after many weeks of staring blankly at Megan Boone’s inexpressive, Bambi-like features and wondering if she got cast on this show through some sort of clerical error, tonight was the first time it hit me that it may be because, with her dark hair and clear eyes and the baby fat in her cheeks, when she’s in action-heroine mode, she looks a teensy bit like Jennifer Lawrence; she could almost be Katniss Everdeen’s older sister, though it’s hard to picture cheering throngs hanging on her every word. While she’s picking off extras, Anslo tries to impress Red with the strength of his desire for revenge by first shooting Red’s associate Luli—the sound of the gunshot followed by red matter splashing all over the walls of Red’s container as if the strawberry preserves has exploded—and then points a gun at the head of Red’s faithful bodyguard, Dembo. Looking up at his boss, Dembe proudly declaims, “Ours is a friendship forged once in this life, and again in the next,” as if he thought that it might be worth getting killed just to finally have some dialogue. Is this supposed to be emotionally affecting, and are the many, many close-ups of Red twisting and cutting Ressler’s mangled, blood-soaked limbs meant to inspire any reaction other than, “Ick! ?” When Elizabeth enlists a techie to help her thin out the bad guys’ ranks, and he protests that he’s only ever shot at paper targets, she tells him, “Pretend they’re paper.” On this show, that doesn’t count as any great act of pretending.